How can so much communication yield so little understanding? What is your Trust Worth? Do less . . . . . . and end up doing more! The anxiety that comes from an uncertain and unpredictable future has the potential to drive detrimental behaviour. Assumption and unexpressed expectation inevitably leads to frustration and anger. Denial usually follows. A person who has experienced being continuously shunned socially may eventually begin to feel that there is nothing to be done about this situation that is in their direct control. This may lead to their stopping this pursuit, trying to engage in social situations, thus making their dilemma even more pronounced. In a business context, the changes brought about by an acquisition, merger or dramatic change provide an equally unpredictable future fraught with anxiety. The initial shock of the situation gives rise to the prospect of opportunity to be capitalised upon by some and “the victim” behaviour by most, such as vocalizing of the injustice of the situation. 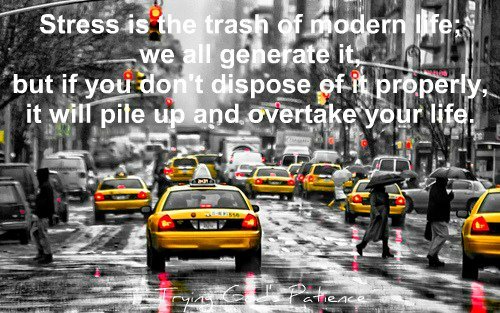 How can uncertainly be “processed” to manifest an inspiring outcome? If you are an anxious person, it is said that you need to stop making the leap into fear. But how do you do that? Easier said than done? A new way of approaching uncertainty may be the key to managing anxiety. Life is always uncertain and pretty much unpredictable. Embrace these facts allows you avoid imagining risks, dangers, and threats that never materialize. 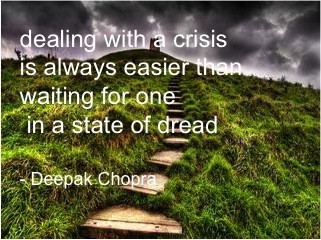 Anxiety is like a shortcut says Deepak Chopra. When faced with uncertainty, a response is to stop, consider what might happen, and make a decision based on the best prediction that can be made and then take responsibility to be in committed action of that decision. The anxious person tends not to go through or complete this kind of process, jumping right towards feeling afraid, perhaps or anger or even being paralysed by shock. No one enjoys uncertainty. The feeling of anxiety that comes with an uncertain and unpredictable future is quite natural. Fear is almost never a good advisor, says Chopra. It blocks clear decision-making, and exaggerates the risks and dangers that might lie ahead. Many spiritual traditions speak of separation as the real cause of human misery. What is crucial is that people are divided inside. One part of the self opposes another part. With guilt, the good fights against the bad. With anxiety, the strong part of the self is at war with the weak part. The challenge here is our belief as to which part is strong and which part is weak. Strong may be perceived as siding with the inevitable due the over whelming feeling of no control – the comfort of being the victim of circumstances! When a situation arises that can be handled well, a part of us feels confident, competent, in charge and in control. When uncertainty crops up, a part of us may feel afraid, helpless, and hopeless. Anxious people never settle this inner conflict. They are so divided that when they feel afraid, the “weak” part is “the real me.” When they are not afraid, the strong part is “the real me.” In fact, according to Deepak, neither is the real self. The real self is beyond conflict; it is whole and at peace. So the long-term approach to anxiety is to rise above the inner war to find a self that is more whole. Psychology indicates that learned helplessness occurs when an animal is repeatedly subjected to an averse stimulus that it cannot escape. Eventually, the animal will stop trying to avoid the stimulus and behave as if it is utterly helpless to change the situation. Even when opportunities to escape are presented, this learned helplessness will prevent any action. While the concept is strongly tied to animal psychology and behavior, it can also apply to many situations involving human beings. When people feel that they have no control over their situation, they may also begin to behave in a helpless manner. This inaction can lead to opportunities for relief or change to be overlooked. Exacerbating the anxious condition brought on by inaction is the pain of presence of the circumstance causing the anxiety, and the pain of absence of the potentially positive experience denied due avoidance brought on by learned helplessness – a double whammy! (ref. Steven C. Hayes, Get Out of your Mind and into your Life). Anxiety and stress go hand-in-hand. We cope with the stress in different ways according to the numbers of stressors (stressful events) we are subjected to, the magnitude and duration of the stressors and our stress threshold . We are not physically adapted to unpredictable stress and sustained stress has been linked to physical health issues. When subjected to a stressful condition, that first rush of adrenaline activates the fight, flight or freeze response. As the endocrine system becomes exhausted, we go into shock when we exceed our stress threshold. Faced with uncertainty, we naturally strive to take control, according to Lolly Daskal, from Lead From Within. Control is an illusion and uncertainty is the reality. The root of our lives is about resisting uncertainty, reaching for a safety zone, but uncertainty is a constant in life. And when uncertainty leads to doubt and fear, we find ourselves stuck. On one hand it can be highly destructive when bombarded by stress that comes at random with no predictable pattern and when faced with a precarious future. On the other hand, all the greatest opportunities in life begin with uncertainty, and the shattering of old forms allows new ones to arise. The positive side of the uncertainty has to do with creativity, says Deepak Chopra. All new ideas come from the same place: the unknown. The most creative people thrive on the unknown: the blank canvas, the white sheet of paper, the blue-sky research project fills them with excitement. They are bored with the known. Conventional wisdom is to be avoided; second-hand answers are not trusted. 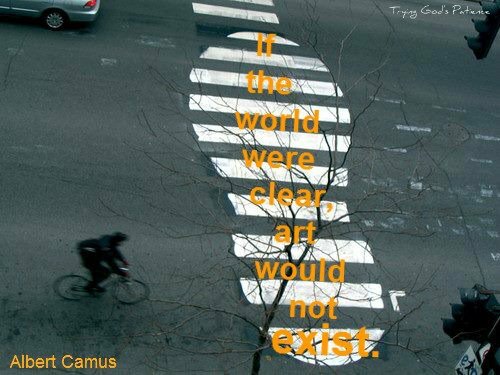 If life wasn’t uncertain, all creativity would disappear. We wouldn’t celebrate the quantum leaps made by geniuses in every field. On a more mundane level, we would all be ordering the same food every day in the same restaurant — which suits a small sliver of the population, admittedly, but which feels gray and drab to the rest. We are in a position to create our own complex responses in the face of a precarious future. Therefore, to embrace uncertainty requires the construction of a belief system that makes unpredictability positive instead of negative, says Deepak Chopra. The important thing to realise is that without uncertainty you cannot reach your highest goals. Only being out of your comfort zone places you in a state of natural tension that allows the possibility of growth. The amounts of courage required to face the challenges outside of your comfort zone is related to how far you are outside your comfort zone and also impacts the quantum of the outcome. As soon as you appreciate that uncertainty is going to prevail independent of your thinking and feeling about it, so does the possibility of a positive outcome manifesting in your reality. Only remaining in your comfort zone, creates the possibility of being “hijacked” by thinking and feeling that does not serve your purpose. One person’s risk is another person’s opportunity. As clichéd as that may seem, the perception of opportunity is more realistic than the perception of risk. Nature doesn’t take a risk when it develops a new species, a new molecule, or a new galaxy. It is using uncertainty as the cradle of creation, which gives us a clue to what our own attitude should be, says Deepak Chopra. We can either battle it or we can become comfortable with it. (making decisions to take responsibility for our own committed action with integrity and doing so by capitalizing on the positive circumstances we have no or low control over and avoiding the negative circumstance). This life is your life and to live it fully, to lead with wisdom, is to let insight find its way to you. – Lolly Daskal, Lead From Within. In conclusion, Deepak Chopra cautions that embracing uncertainty does not mean embracing recklessness. Uncertainty is really a tool to help you overcome the controlling nature of the ego which tells you that you can’t make a correct decision or take action unless you know enough to be absolutely certain. via Deepak Chopra Worry Is a Choice – Oprah.com, Deepak Chopra – Embracing Uncertainty or Recklessness, Deepak Chopra: Why Unpredictability Hurts, But Uncertainty Thrives, Learned Helplessness (What It Is and Why It Happens).